I’d like to offer you a free gift. No strings attached. And I’d like to deliver valuable information like what you’ve found here on the site to your inbox on a regular basis. 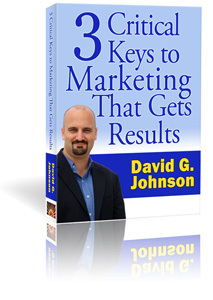 In this e-Book, we talk about why many businesses are simply not getting results in today’s world. Whether you’re using offline media, the web, e-mail, social media, or all of the above, this book has something for you! As a free bonus, you’ll automatically receive notifications about new articles published here at the Strategic Marketing Blog. You’ll be part of a growing community of small business owners, marketing executives, guerilla marketers (maybe even some Gorillas… who knows?) and others who are thinking strategically and leveraging technology to get results. My promise to you is this: I’m not going to waste your time. I’ll deliver value. Period. Every single message you get will have a link at the bottom you can use to control your preferences… preferences which I respect. Absolutely. Simply Put Your Name and Email Address in the Boxes to Start Your FREE Download Right Away! Your name and e-mail address will never be sold, rented, or otherwise given out to anyone. Ever. I’m committed to growing your business. Welcome to the journey!